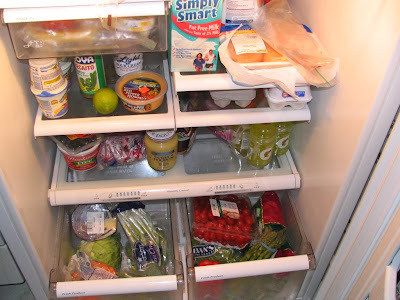 Okay, so I took a photo because I could not believe how "on plan" my frig is! lol Check out all the fresh veggies and low or no fat condiments, etc. How about that? Gone is the 12 pack of Pepsi, no big slabs of American cheese, no leftover pizza, no high-cal nuttin' there! And I have been cooking for myself nearly every night as opposed to going to some fast food place and spending too much and having empty calories that only left me hungry later on to go 'grazing' in the kitchen come 8:30 or 9pm. The amazing thing, too, is that I'm happily trying new recipes I'm finding on Weight Watchers online or in magazines. I've been making Mexican a couple of times a week with chicken breast, onions, peppers, and am love, love, loving Mrs. Dash seasonings! They're low salt and have all different flavors. My two favorites right now are the chipotle and the lemon pepper. Both are great! It finally feels RIGHT to eat this way... to taste the actual taste of fresh foods and not just whatever sauce I ladeled over or slathered on bread to have with the foods.